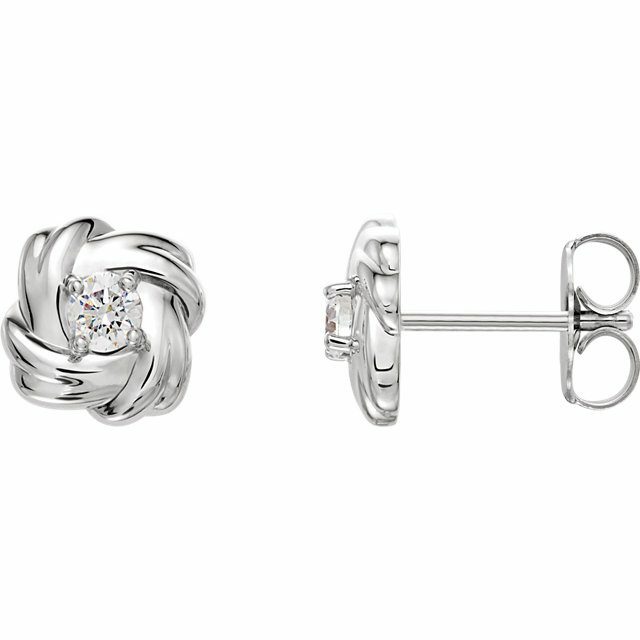 These Diamond Knot Earrings are elegantly accented with a 3mm diamond. Set in 14K Gold with 1/5 a carat worth of sparkly SI1-2, HI color diamonds, they are understated, yet noticeable. They are about 1/4 of an inch tall and would become larger with a larger stone. STONES: 1 tcw I1, GH color diamonds. Other qualities and even types of stones can be used. METAL OPTIONS: Sterling or Argentium Silver, White Gold, Rose Gold, Yellow Gold, Palladium, or Platinum. The listed price is for Diamond Knot Earrings in 14K with Si1-2, HI diamonds. Contact us for alternative pricing options. Click HERE to see a mathcing pendant or contact us with your idea for a pair of custom Diamond Knot Earrings.